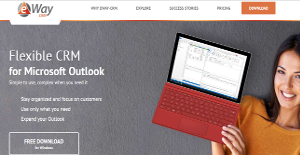 eWay-CRM is a comprehensive, fully-featured CRM for Outlook users in the retail sector looking to improve traction with their customers, and turn basic data into operable intelligence. It won our Expert’s Choice Award for 2017 as well as the Supreme Software Award. Unlike traditional relationship management tools, eWay covers a variety of marketing and sales extras that frequently result in smarter business decisions and boosted revenue rates. The system is also a reasonable alternative for tracking stats and completing analyses, as it supports all traditional reports needed to evaluate progress, and also enables custom reporting for the needs of specific providers and industries. The distinctive advantage of this system is customization – you get to tweak a large portion of its functionality to your needs, including cool bells and whistles such as notifications and reminders. All configuration actions on the intuitive and friendly interface are conducted using a drag-and-drop mechanism, and a Word-like text editor that doesn’t take time to learn. As expected, eWay meets traditional customer management needs, sales pipeline activities, and marketing arrangements (discussed in the benefits section below). In case you need help or have a question, a knowledgeable support team will be a phone call away from getting the job done. You should also have in mind that the system is fully-mobile optimized, and offers a native Android app that reveals no difference to the traditional desktop version of this system. In fact, there are a variety of innovative features that make the app even more attractive, including contact synchronization and offline access. The company did a good job producing a universal CRM, which is why eWay is now available in a variety of languages, and operable across all geographies. The all-in-one CRM platform is made accessible to all companies and software architectures, in part because of its open API infrastructure and unlimited connectivity, and mostly because of the flexible pricing scheme that fits into nearly every budget frame. Startups and small business get to use the system for free; developing companies can resort to a per-month subscription to examine the tool’s capacity to grow in line with them; while established enterprises can benefit from a life-time license hosted on their own server. How exactly will eWay-CRM improve the productivity of your business? As our experts like to put it, the uniqueness of this relatively young and promising system hides in its best-of-breed combination of traditional CRM with creative relationship management practices. What this means is that eWay won’t be much of a learning burden for low-tier market retailers and small teams, but will still give experienced and large companies an array of distinctive features to keep them ahead of competition. And while we speak of this as being ‘as far as a CRM service can go’, eWay is already on its way of adding value to a tool you can actually get for free. Microsoft Outlook is where most businesses kick and complete customer-management communication, so why not turn it into a centralized hub for all your customers, vendors, suppliers, and personal contacts? eWay makes this possible by keeping your contacts well segmented and organized, and allowing you to filter them according to preset or custom fields. All projects, leads, and communication history per contact will be readily available in Outlook, and shareable with the rest of your team. This is the stage where eWay’s influence becomes most visible – this time, you won’t only have information presented to you, but be able to maintain and track that information, understand what it is about, and put it into action. eWay tracks customers and makes notes for you, ensuring no meeting or important event slides through the cracks. In order to make your service more professional, you can create personalized messages and attach wildcards and special offers to them. Best part is, you’ll be informed of whether customers open your messages, and how they react to them. Each email you receive is automatically inserted in the contact’s profile, from where you can access it both online and offline, and use it to plan your further communication. The system also offers a specialized Company Module, which stores all attached documents and journals of individual contacts related to that company. eWay CRM is designed to turn customer data into operable intelligence, and the Marketing Module is exactly where the magic happens. More than a streamlined communication platform, eWay is a smart system that directs customer behavior, gathers the necessary feedback, and helps you improve the quality of your decisions. To start with, you can drag-and-drop both your data and your filled templates to the system, or create whole new and personalized campaigns for targeted groups of customers. The easy-to-use text editor will help you prepare catchy marketing messages, where you can also use wildcards and personal attachments. Feedback is tracked automatically, and in the form of concise charts and statistics that help understand whether your campaigns are financially rentable. The Lead Module available in this system is devoted to managing individual business cases, and producing workflow diagrams that keep all sales reps on the same page. Once your marketing campaigns are active and fully arranged, the system converts incoming emails into leads that are later evaluated and classified according to your needs. You are also enabled to add leads manually, or import the ones from eWay’s special web forms embedded on your website. This makes it easy for you to depict buyers and opportunities, generate tasks automatically, and assign them to the right sales rep. Thanks to the detailed pricelists, you can make instant quote for your buyers, and use the history of your communication to evaluate overall sales performance. The Project Management Module of this system is a rare catch in the CRM industry, and will certainly become your favorite thanks to features such as lead-to-project conversion. All communication history with an important client is automatically imported in your projects/tasks, so that agents won’t miss any important detail preparing your delivery. The system allows you to adjust the workflow to the type of business, and generates the tasks and stages that would be most appropriate. What is more, it will also set your deadlines and milestones, and remind you once those are approaching. Obviously, eWay is not all about existing projects, and can also help you create such with only few clicks. You can plan tasks in line with communication, and associate the system’s project calendar to your Outlook and Google Calendar. This makes it possible to fully compare what you achieved to what you were supposed to achieve. Once again, all projects will be fully visible for all members of the team (that’s unless you’ve introduced special roles and permissions to secure sensitive data). You can also use eWay CRM for analytic purposes, as data is always ready and available for processing. The system supports all expected types of reports (sales efficiency, agent performance, finances, project accomplishment, customer communication, and more), and allows users to create custom summaries for specific activities. All reports are ready to print, and exportable as Word, Excel, and PDF files. Export to Microsoft Excel, PDF or Microsoft Word. What Problems Will eWay-CRM Solve? A typical sales or project manager keeps his contacts and emails in Microsoft Outlook. But what if he/she becomes unavailable when a client calls the company where no one knows anything about their previous communication? Instead of addressing the client’s needs, employees struggle to find the information and project an unprofessional image to the client. In eWay-CRM, contacts are shared among all team members. Emails are automatically tracked, and users log their activities. The Outlook integration allows them to link calendar events or tasks to specific contacts. Hence, anybody can access the data and use it to solve the client’s problem smoothly. Tackling issues on the go is even easier with the mobile app. The sales department has five team members. Everybody is a great sales rep trying to do the job as good as she/he can. But the company has its own best practices, wants to use the same company templates and unified communication. Since the final decision is up to every sales rep, this goal is never achieved. Everybody does the same task differently. Most companies hire skilled sales representatives, but the coordination of any sales team is challenging. People often use different methods to achieve a deal and follow their own rules. However, every brand needs a consistent approach and tools to manage the sales. eWay-CRM can automate the process and make it more efficient. A customizable workflow feature encourages the employees to follow the best practices. The system automatically sends reminders and notifications and ensures that all important data is archived. Users can save time by using templates and create quotes or contracts in eWay-CRM. CRM software helps manage contacts and build relationships that ultimately lead to sales. And then? Companies often use different applications for CRM, resource planning, and project management. Copying data from one to another is overwhelming, unproductive and managers lack to see the big picture. Why not use one solution for everything? eWay-CRM includes a project management module that can be turned on when needed. When a sales rep closes a deal, it can be converted to a project that contains all related data and materials. The project manager responsible for the project has instant access to any previous communication with the client and can start working immediately. As the project manager and her/his team work on the job, all documents, notes, tasks and emails are saved to the card of the particular project. Even the top management can see how the project is going, get customized reports in eWay-CRM and run the company efficiently. Since each enterprise has unique business wants, it is prudent for them to abstain from seeking a one-size-fits-all perfect software system. Needless to say, it would be futile to try to find such a system even among widely used software solutions. The smart thing to do would be to catalog the various essential aspects that require consideration such as main features, finances, skill levels of staff members, company size etc. Then, you should do your research thoroughly. Read some eWay-CRM reviews and investigate each of the other solutions in your shortlist in detail. Such in-depth groundwork can make sure you discard ill-fitting systems and select the system that presents all the aspects you need for business success. How Much Does eWay-CRM Cost? We realize that when you make a decision to buy CRM Software it’s important not only to see how experts evaluate it in their reviews, but also to find out if the real people and companies that buy it are actually satisfied with the product. That’s why we’ve created our behavior-based Customer Satisfaction Algorithm™ that gathers customer reviews, comments and eWay-CRM reviews across a wide range of social media sites. The data is then presented in an easy to digest form showing how many people had positive and negative experience with eWay-CRM. With that information at hand you should be equipped to make an informed buying decision that you won’t regret. What are eWay-CRM pricing details? What integrations are available for eWay-CRM? eWay-CRM is an open API system, which means you can connect it to virtually any third-party system or business application. TO facilitate service delivery, the system offers a native integration to Microsoft Outlook. Contact the vendor for technical details. If you need more information about eWay-CRM or you simply have a question let us know what you need and we’ll forward your request directly to the vendor.